Quick, name a Russian dish. 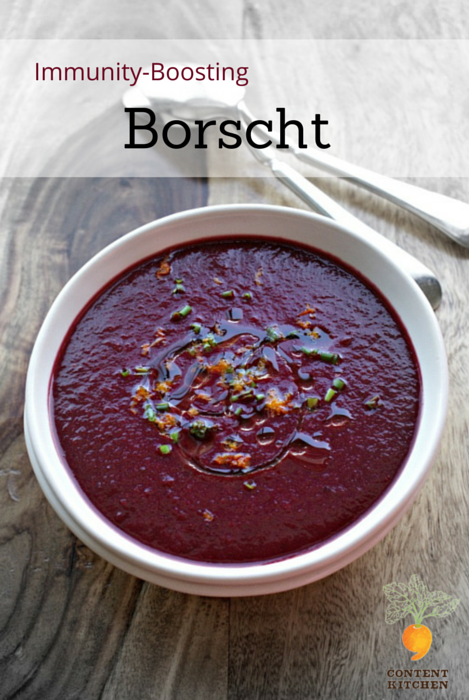 Bet borscht is the first thing that comes to mind. It’s practically a national dish in Russia, Ukraine and Poland. 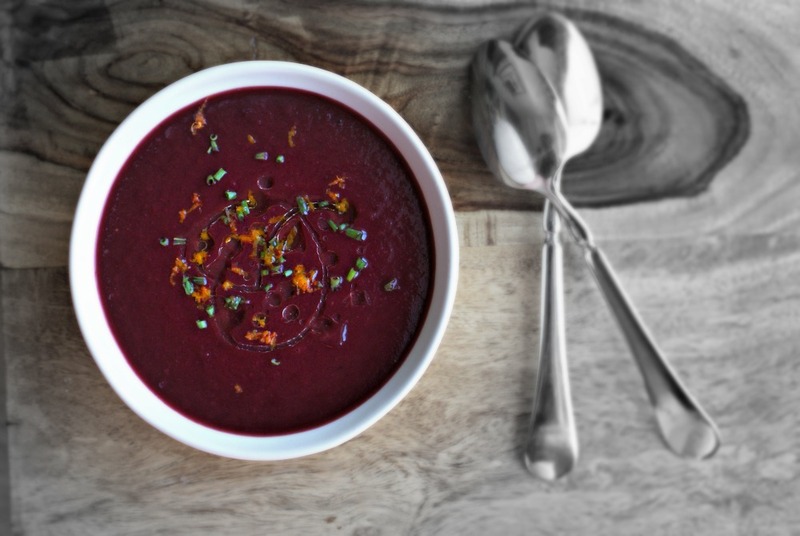 Traditionally, this simple soup, also called borsch, starring beets (with a whole lotta other vegetables as supporting players) is made with beef or chicken stock and garnished with a dollop of sour cream. But this vegan version is a variation of a recipe I developed for the January/Feburary 2015 issue of Women’s Health magazine and gets its richness from a luxurious drizzle of walnut oil. You can also bolster this jewel-tone soup (using purple potatoes enhances its hue) with mushrooms and/or white kidney beans. I’d also garnish it with barley. Whatever add-ins you choose, the soup is an antioxidant superpower that will help boost your immune system. Borscht is served hot or cold, but I love it hot with a side of Polska Foods’ Mushroom & Cabbage Pierogi, which I discovered at the Fancy Food Show in January. Talk about a meal that puts me in touch with my Ukrainian roots — Смачного! A food processor fitted with a grating attachment makes quick work of grating the beets, potatoes and parsnip. Trim greens from beets and reserve. Peel beets, cut off the taproot and stem, and cut beets into quarters. Grate beets. Heat oil in a medium saucepan over medium-high heat. Add onion, celery and a pinch of salt; sauté 3 minutes or until tender. Add garlic; sauté 30 seconds or until fragrant. Stir in beets, potatoes, parsnip and a generous pinch of salt; sauté 2 minutes. Add orange juice and cook 30 seconds, scraping the pan to loosen any browned bits. Add broth, and bring to a boil. Cover, reduce heat, and simmer 20 minutes. While soup simmers, clean and coarsely chop beet greens (discard stems). Add to soup, cover, and cook 5 minutes or until beets and greens are very tender. Add salt and pepper to taste. Puree the soup until smooth, using an immersion blender, blender or food processor. Serve garnished zest, chives and a drizzle of walnut oil.